Risotto is easy and toddler-friendly food. Alec has never been a huge rice fan, but he likes this risotto and so do we. Because green makes us happy! Keep broth warm in a sauce pan. Sauté shallots, garlic, and celery in butter and olive oil over medium heat for a couple of minutes before adding rice. Sauté everything until transparent but don’t let it brown. Add a ladle of broth and stir. Keep the risotto add low to medium heat. Once all the broth has been taken up by the rice, add another ladle. Repeat until the rice is as soft as you want it. I like it a little al dente, but creamy. Don’t let it get overcooked and porridgy. While you’re ladling and stirring, give the zucchini, broccoli and peas a quick sauté in some olive oil. You want them to soften but don’t let them cook too long or all the lovely green will fade. Mix rice, veggies, basil and feta together and serve! This is not the best recipe to make a ton of because it definitely doesn’t freeze and it is definitely best enjoyed right away. 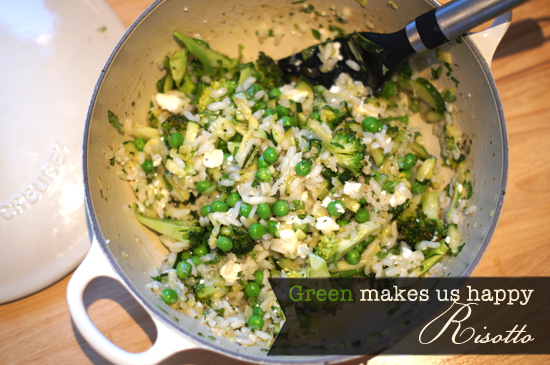 But it is super yummy and a great way to get some greens into your kids! For more yummy and easy family-friendly vegetarian cooking ideas, see Mini Veg here.